في ظل أحداث ثورة 25 يناير، أثبت الشباب المصري للعالم أنه قادر على صنع التغيير وتخطى الصعاب من أجل تحقيق الأمن الاستراتيجى والإنطلاق سياسياُ وإقتصاديٌاُ. لذا يقوم برنامج تمكين الشباب بإكتشاف وجذب وتمكين القيادات الشابة، من الجنسين، الذي لم يكن لديهم الفرصة لاظهار امكانياتهم ومواهبهم القيادية للمجتمع ، خلال الفترة السابقة، سواء فى الحياة السياسية او الحياة العامة . إتاحة الفرصة للشباب المصري، من الجنسين، ليكونوا قادة و يشاركوا في بيئة ديمقراطية صحية. تزويد 6000 شاب وفتاة بالمهارات السياسية و القيادية اللازمة للتعامل بفعالية مع المشكلات والتحديات المحلية على المستويين السياسي و الاجتماعي . دعم ثقافة قبول الشباب لدي مجتمعاتهم عن طريق إلقاء الضوء على اعمالهم وأدوارهم في مجتمعاتهم و نشر افكارهم عن التغيير الاجتماعي و السياسي. 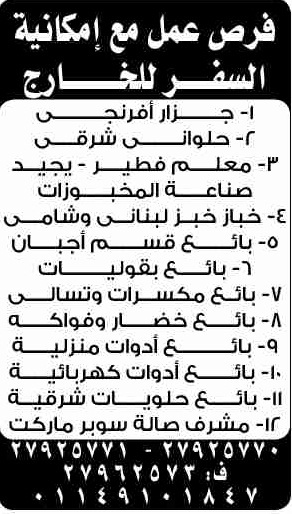 دعم الشباب في تعظيم جهودهم من خلال وسائل التواصل الاجتماعى و المواقع الاليكترونية . To supply goods for the company in optimal quantities. To not exceed targeted unavailable products, to realize the central warehouse stock turnover rate and to organize test sales of new products that are aimed for selling at all companies. To carry out the shipment of products which meet the legal quality standards and which fulfill the requirements of quality agreements made with producers. To work in cooperation with all departments of the company in every respect in an effort for the company to achieve better results and success. 1.To order all products in optimal quantities from suppliers. 2.To perform quality control on a regular basis. To test the conformity of the quality between the sample given by the producer and the product itself. To decide, if need be, whether or not to purchase the good according to the information given by the reception of goods unit. To send the products to a laboratory for testing, if need be, and to inform the General Purchasing Manager about the results. 3.To offer consultancy service to the General Manager on all issues related to purchasing. 4.To specify the purchasing conditions of products at the testing level, particularly those in his/ her partner group, in compliance with the testing and regional product procedures, to present the conditions to the GM. To analyze the results of products tested. To make the necessary preparations and present to the GM the product which achieved regional sales success with the aim of offering it to other regions. 5.To negotiate and bargain with producers for maximum 5 to 7 products (except for Spot products), in compliance with the testing and regional product procedure, to specify purchasing conditions and present them to the GM. To make proposals to the GM regarding the purchasing, withdrawal and sales price of these products. 6.To make proposals to the GM regarding the withdrawal of products which show poor sales in the region and in the general product range. 7.To make necessary preparations for the order of speculative products, imported products and pricing and to present them to the GM. To ensure that the orders are received within the specified time period. 8.To ensure that the number of stock out products in the warehouses is 10 maximum and the stock turnover rate is 4 minimum. 9.To make weight and quantity tests of 3 products at the reception of goods unit on a daily basis and to keep records of these tests. 10. To select one product for taste tests every day and at least 3 products for laboratory tests every month, to keep a record of their results. 11. If need be, to decide on the sales of products in the warehouses. ... -Able to deal with kids. University graduate, Perfect English, Presentable, Owns a car. It will be preferable if he's experienced in shipping incoterms, Import & Export or Logistics. The E-mail Subject should be: Outdoor Sales "to consider your CV"
Apply now and join the number ONE worldwide contact center! - B.Sc. in Computer Science or Computer Engineering. - 3-5 years of experience. - Excellent knowledge of ASP.NET, C#, and MS SQL Server 2005. - Good command of both written and spoken English. - Accuracy, concentration, efficiency, attention to details, good communication skills, highly organized, self-motivated, problem solving skills and ability to learn. - Bachelor’s degree (Art related is preferable). - 0- 2 years of related experience. - A strong sense and appreciation of aesthetics and design elements such as: color, balance and typography. - A high level of creativity merged with a practical knowledge of the various production processes. - Ability to follow corporate guidelines and preset templates. - Experience in Adobe Creative Suite and other design software. - Excellent computer knowledge (email, internet, word processing). - Good research skills to help produce appropriate and functional designs. - Flexible design ability to help ensure agreeable outcomes. - Ability to handle multiple tasks with changing priorities in a timely manner. - Keeping up to date with trends and applications in the design field. - Good communication skills, strong attention to details. - Work with an energetic collaborative team. - 2-3 years of experiences in mobile applications development in one of the major mobile platforms is needed. - Any experience in developing applications for iOS devices will be an advantage. We need more than 35 new employee so please spread the word! Kindly write “ASP.Net_in” at the email subject line. • 2+ year experience in the selected knowledge area. • Ability to conduct instructor-led in-house, on-site training sessions. • Strong verbal presentation, teaching and technical skills. • Strong customer service skills self-motivated and dedicated. • Ability and willingness to work independently and with a team. ANY cv without position quotation in the title line will be DISREGARDED. المزايا : تأمين طبي واجتماعي - بدلات انتقال - سكن للمغتربين. المقابلة الشخصية: يومياً عدا الجمعة من الساعة 10 صباحاً الي الساعة 3 عصراً. 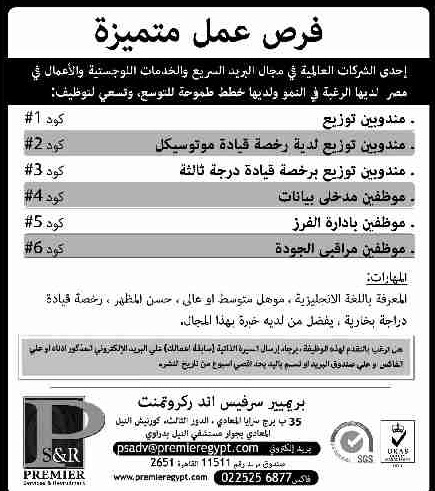 1) A professional graphic designer is highly required for a new company in Egypt. 2) A professional (Joomla developer) is highly required for a new company in Egypt. 1-Maintains the Company Safe which includes all original contracts made with the company, licenses, original studies, original financial statements and company original legal documents. 2-Organizes the business agenda, appointments and phone calls of CFO & Owner’s Representative. 3-Arranges for reservations with the Hotel & keeps track of FAHR rates & Invoices issued according to the said reservations. 4-Keeps track of FF& E Budget with the Hotel & update FF&E list with coordination of the Hotel. 5-Drafts, issues and distributes approved correspondences of FF&E that should be sent out from CFO& Owner Representative’s office. 6-Distributes the Bank Correspondences & copies to all the concerned parties of the delivered Bank Correspondences. 7-Keeps track of the shared log files and reference numbers of all outgoing correspondences of that should be sent out from CFO & Owner Representative’s office. 8-Receives business correspondences, faxes and e-mails directed to the CFO & Owner Representative , hence classifies and saves it electronically In addition to distributing to different departments if necessary as well as necessary following up. 9-Transcribes of CFO instructions to different parties and follows up of on ground implementation of relative decisions. 10-Follows up all related materials concerning her office including computers, administrative and operating supplies. 11-Prepares the daily schedule for the CFO & Owner Representative. 12- Maintains a proper accurate filing system for data, memorandums and correspondences. 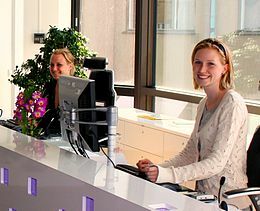 13-Receives and screens office callers and visitor schedule and sets up appointments. 14-Receives, opens and sorts all incoming mails and dispatches outgoing mails. 15-Monitors and maintains office supplies inquiry as well as reviews requisitions. 16-Follows up the condition of the office and arranges for necessary repairs. Please write in the email subject line Executive Secretary&Years of Experience. - Prepare variety of status reports including activity, closing deals, and following up. - Present and sell company products and services to current and potential clients. Note : your interviews will be held weekly starting from sunday to thursday from 3:00 PM till 6:00 PM and please bring a hard copy from your c.v with you. - Intelligent, capable of training, learning fluent self, loyal, Secretary, is committed to work, it is estimated, and responsibility, the speed in implementing the tasks and duties, ambition. Fluent English Speakers are required for Customer Service Representative positions. •Excellent command of English is a must . •Ability to work under pressure. •Flexibility to work anytime during the 24 hours. •Willing to relocate to Alexandria. — in Alexandria, Al Iskandariyah. - 3-5 year experience as e-marketing or marketing. *** If you don't have 3-5 year of experience in "Marketing" please DON'T send your CV with this subject . If you interest kindly send your up-dated resume with recent photo to Yasser.arafat@elan-eg.com & pls mention job code in mail subject otherwise it’ll be automatically regret. Developers for Training and Consultancy has an excellent opportunity for Sales Engineers. • 33 - 35 years old. 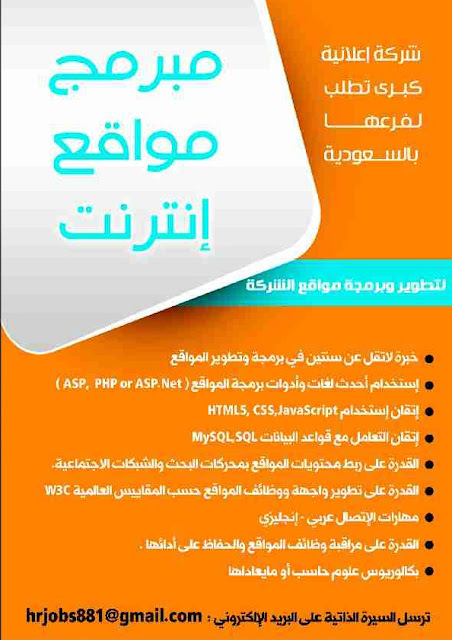 If interested please send your CV to info@developers-egypt.com quoting the job title in the email subject. Engineering Consulting Office (SAAB) at El-Mohandeseen requires an experienced secretary for the after noon hours (from 2 pm to 8 pm), with excellent Microsoft Office, Computer, English, and Communication skills. * If interested please send your CV attached along with a recent photo to info@saabegypt.com mentioning the job title "Secretary" in the email subject. • after six months work, the employee can apply for another position either in administration or in another account.